We'll forgive you if you thought that Matthew McConaughey is the main character in White Boy Rick. In fact, McConaughey is playing second fiddle to Richie Merritt who plays the Rick in the title of Yann Demange's latest thriller. 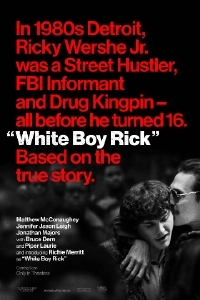 The director of '71 and "Dead Set" tackles the rise and fall of Ricky Wershe Jr., AKA White Boy Rick; the hustler, drug kingpin and youngest FBI informant ever (he was 14), who rose to prominence in 1980's Detroit before being arrested and charged with dealing cocaine. Along with McConaughey and Merritt, the movie also stars Jennifer Jason Leigh, Eddie Marsan, Bruce Dern, Piper Laurie and Bel Powley. Demange made a big splash with his feature debut '71 which showed his ability to tell a small story amidst large-scale drama and he seems to be doing the same thing here though this story appears to have much more room for laughs which Demange and the actors, particularly McConaughey, are taking full advantage of. Hopefully, this will play better than some of the other biopics of real-life criminals (thinking specifically of the terribleness which was Black Mass). White Boy Rick opens September 21.